This thing is incredible! Thanks to Pinterest, I’ve been making everything in it...including ‘deep fried’ Oreos (which probably defeats the point of it being healthy ). I do make healthier choices as well. Of course you can make great fries, but you MUST go on Pinterest to discover how versatile this machine actually is! I eat mostly low carb and I can make pretty much anything including fried chicken, catfish, bacon with no grease and much more! Enjoy crispy fried foods without the heavy calories of grease and oil with this air fryer. 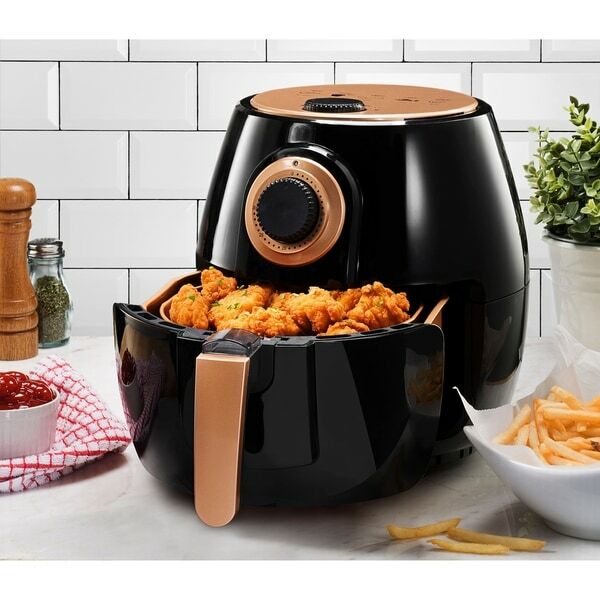 With a range of adjustable temperature settings, the fryer quickly prepares food from frozen, allowing you to whip up delicious chicken, French fries, onion rings, and more. Cord Length More than 1 ft. This has been a life saver easy to prepare food without all that excess grease. I glad that now my foods will still taste good and still be more health wise. If you're in the market for a air flyer I recommend this is a excellence one. Let's get healthy together. I like the air fryer; the food tastes great. It works just as described and has a guide for usage directions/recommendations. Eventually, I tweaked things to my preferences though. I would definitely recommend this to my friends and family. Although 2.6L is on the small side it is perfect for cooking crispy chicken with no or little oil. Just season your chicken well. I really like this product. This is the perfect size air frier! I bought this as a gift but I couldn’t wait and opened it for myself. Super easy to use. Everything comes out warm and crispy. I did chicken nuggets first and then fries. Big enough to do both but since it was my first time to do it by myself. My mother in law will love this! Love it so far. It does an especially great job with potato wedges. They come out crispy and without the guilt of deep frying. I would definitely recommend to all. It's been very useful and we're happy with the purchase. We just can't put a whole lot in there since it won't cook evenly. As soon as we figured it out, we were all good. Christmas gift for a special someone and she loves this item. Cooks great and tastes great. Well worth the price - excellent packaging! Nowhere in the description does it say you have to turn the contents. To much trouble, and it takes up quite a bit of counter space. I returned the air fryer because it did not perform as expected. It looks compact, sleek, it matches my interior decoration. I always water to try air flyers for my health. In order to get the most out of your deep fryer, you need to know how to clean it and care for it properly. If you cook with your deep fryer frequently, it's important to clean and change the oil once or twice a week.